The majority of visitors come from Canada, United States & Mexico. 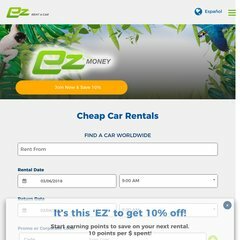 e-zrentacar.com Discount Car Rentals | Cheap Rental Cars | Rent A Car Deals | E-Z ..
1,615 users visit the site each day, each viewing 4.20 pages. It has 2 DNS records, udns2.ultradns.net, & udns1.ultradns.net. Its web server is located at Ez Rent-a-car (Florida, Orlando.) Its IP Number is 69.64.176.34. The server is slower than 68% of measured websites, at 2118 milliseconds.